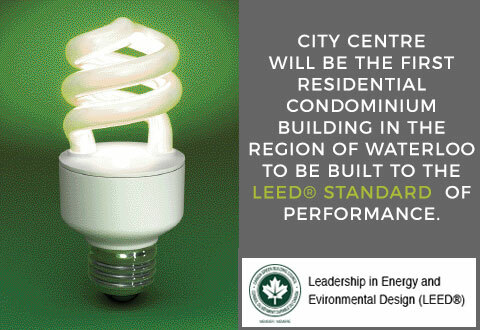 Leadership in Energy Efficiency and Design (LEED®) is an internationally recognized rating system in which points are awarded for environmentally friendly building characteristics in 5 key areas: sustainable site development, water efficiency, energy efficiency, materials selection, and indoor environmental quality. High efficiency Heat Pump heating system for reduced energy consumption, non-ozone depleting cooling systems and lower emissions. Energy Recovery Ventilators (ERV) capture heat that is typically lost from exhaust air and uses it to warm incoming cool air, reducing heating costs. High performance thermally separated aluminum window frames with Low-E coating, argon gas filled and double pane sealed glazing units with operable awning windows to fill the room with natural light. Individual suite metering for hydro consumption. Convenient “All-off-Switch” for simple in-suite lighting control; just one flick turns off all fixed lighting. Fully programmable thermostat allows you to set the temperature in your suite to your comfort level when you are home and adjusts for increased energy savings when you’re out of the suite. “Appliances can account for nearly 20 percent of the average household’s energy use”. ENERGY STAR appliances are standard in every suite at City Centre and include a stainless steel refrigerator and dishwasher and a front loading washing machine. Each of the suite’s electrical fixtures in City Centre will only accept Compact Fluorescent Light bulbs ensuring that the lighting remains energy efficient into the future. Highly reflective rooftop membranes to reduce heat gain in the summer and reduce the stress on air conditioning systems. Higher energy efficient building envelope to aid in the reduction of heating and cooling costs. Low Flow Shower Heads which are specially designed “to provide a comfortable shower while using up to 25% less water than a standard showerhead”. Dual Flush Toilets “allow you to reduce your water consumption by over 32% A small flush of only 3 litres uses ½ of a conventional low flush toilet while the large flush is a conventional 6 litres”. Reduced flow aerators in all bathroom and kitchen faucets. Energy Recovery Ventilators (ERV) to filter outside air and deliver it directly from the exterior through the ERV rather than being fed from corridor air from under the entry door as is the case in a typical condominium. Low emitting materials (LOW VOC) such as ceramic flooring and low toxicity paints.